San Francisco de Assisi Mission Church in Ranchos de Taos, New Mexico still serves a congregation today. By Kathy Weiser-Alexander. Ranchos de Taos, just four miles southwest of Taos, New Mexico, is a tiny village that is home to the San Francisco de Asis Church, a National Historic Landmark. Before the Pueblo Revolt of 1680, the Spanish recognized the opportunities for settlement of the rich, well watered Taos Valley in northeast New Mexico. Though attempts by missionaries had been made to convert the area Indians, the local people and adamantly resisted. This, however, did not stop the Spanish from moving northward from Mexico, and attempting to rule over them. This culminated in the Pueblo Revolt in 1680, effectively driving the Spanish out of the area for the next 12 years. The Spanish then began to return and Spanish control was initiated when an alcalde mayor was appointed in 1715. Spain began to issue land grants one of which is was called Las Trampas de Taos. 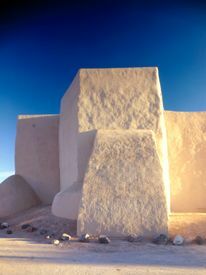 In 1725 it became a permanent Spanish settlement called Ranchos de Taos. In 1760 Ranchos de Taos was attacked by Comanche Indians who kidnapped 56 women and children and killed 17 people. Those Hispanic survivors who remained in the area then took refuge at the Taos Pueblo for their mutual protection. Over the next 20 years, the settlers cautiously returned to their farms and plazas. These early settlers usually grouped together in small fortified communities which consisted of contiguous houses built around a central open area that could only be entered through a side fortified gate, referred to as plazas. In 1772 a mission church was begun at Ranchos de Taos with Franciscans supervising the construction. 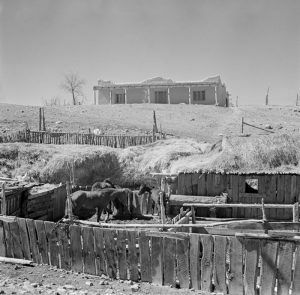 In 1776, Francisco Atanasio Domínguez wrote that “the settlement consists of scattered ranchos, and their owners are the citizens who live in the pueblo.” At that time, Ranchos de Taos was the largest Spanish settlement in the Taos Valley. By 1780, it was written of the community: “the settlement forms a square plaza, very capricious. Its houses were almost finished in 1779 with towers at proportionate distances for their defense.” The plaza, with its unfinished church within it, enclosed over two acres in order to hold all the community’s livestock in the event of an Indian attack. In 1796, the village of Taos was formalized with the issuance of the Don Fernando de Taos Grant. At that time there were six Hispanic plazas in the area which were called home to 779 Hispanos. For the next two years, land from the Don Fernando de Taos Land Grant was given to 63 Spanish families. 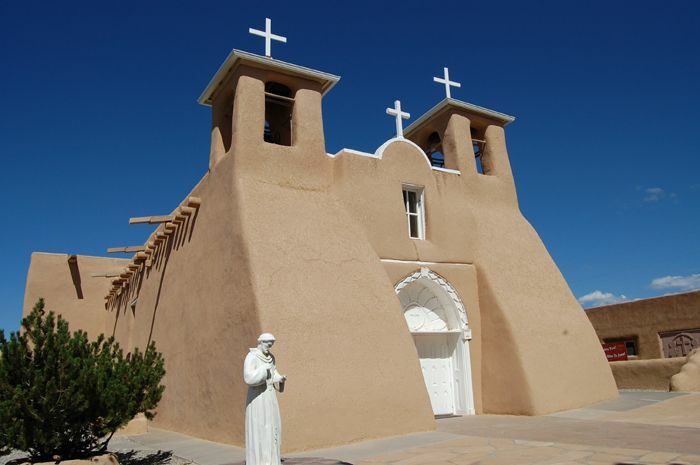 Fray Jose Benito Pereyro, a priest of the Taos Pueblo, agreed to serve the settlers of Ranchos de Taos and in 1816 the San Francisco de Asis Mission Church was completed. The San Francisco de Assisi Mission Church is a large, sculpted Spanish Colonial church with massive adobe buttresses and two front-facing bell towers. The architecture of the church is an impressive blend of native and Spanish styles. Three white crosses adorn the two towers and church entranceway. Four “beehive” shaped buttresses support the back of the church structure and two buttresses in front of each bell tower support the front. Inside the church, stairs lead to a choir loft above the entrance. The large sanctuary provides ample space for worshippers and visitors, and the altar is decorated with original Spanish woodworking and religious iconography. A thick adobe wall surrounds the church, cemetery, and forecourt. Today, the Francisco de Assisi Mission Church remains an important center of community life and the citizens of Ranchos de Taos ensure it stays in good condition. During major restoration in 1967, workers applied a hard plaster to protect the exterior and prevent future damage and added a new roof. They also replaced the church doors with accurate replicas of the originals, and the vigas — wooden ceiling beams– and 60 percent of the corbels with historically accurate reproductions. Despite this attempt to protect the church, the hard plaster proved to be damaging. 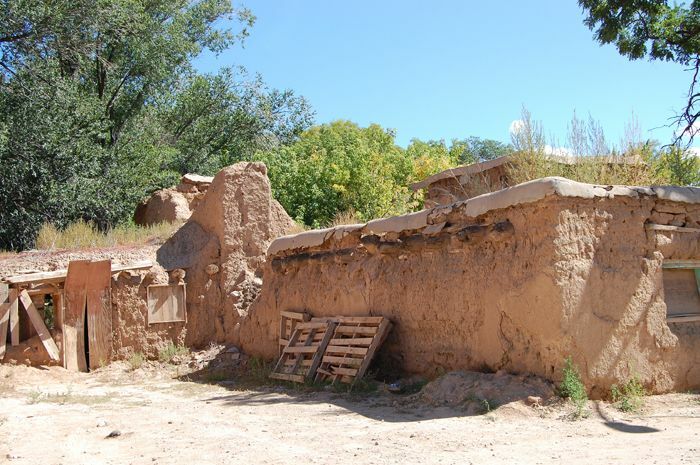 Since this time, citizens of Ranchos de Taos, parish members, and visitors gather for two weeks each June to re-mud the exterior of the adobe church with a mixture of mud and straw. 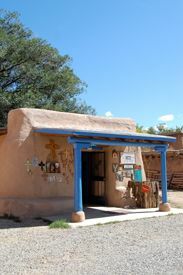 Shops at Rancho de Taos, New Mexico today by Kathy Weiser-Alexander. Because of its imposing form and sculpted body, the church is a favorite subject for artists and photographers. Ansel Adams photographed the church for his Taos Pueblo art book and Georgia O’Keeffe painted a series of perspectives of the church. O’Keeffe once described it as “one of the most beautiful buildings left in the United States by the early Spaniards.” In most works, these artists favored the view of the back of the church, with its smoothly sculpted adobe beehive buttresses. The beautiful colonial-era church continues to attract artists and the Ranchos de Taos plaza is home to several galleries. A video of the art and history of the mission church may be viewed at the parish office and gift shop, where santos (saints) and retablos (alterpieces) made by local artists are sold. 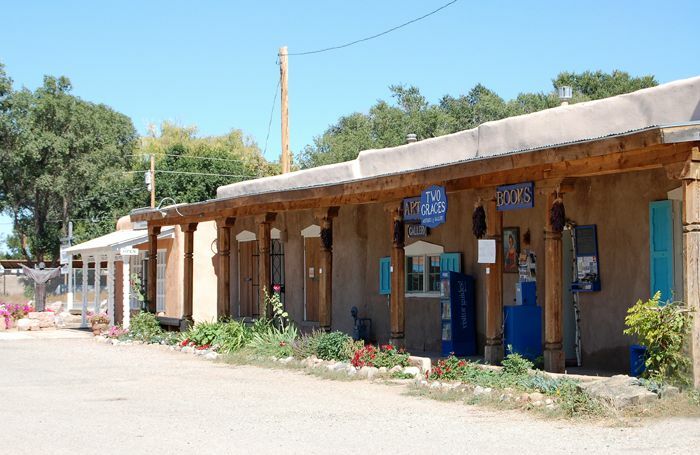 Along the plaza are adobe buildings that now house retail stores, galleries, and restaurants. The Old Martinez Hall, now named Old Martina’s Hall, has been lovingly renovated by Martina Gebhardt and renamed in her honor. The enormous vigas spanning the great hall were preserved along with the massive adobe walls. Rancho de Taos, New Mexico Ruins by Kathy Weiser-Alexander. 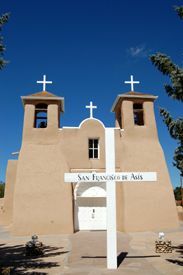 A National Historic Landmark, the San Francisco de Assisi Mission Church is part of an active parish in the Santa Fe Diocese that continues to serve the Ranchos de Taos community with regular masses and festivals. Located about three miles south of the town of Taos on NM State Road 68. The church is open year-round to visitors and the plaza offers shopping, food, and art. The area population of Ranchos de Taos today is about 2500 people. A colorful shop in Ranchos de Taos, New Mexico by Kathy Weiser-Alexander. Flint, F. Harlan; Hispano Homesteaders: The Last New Mexico Pioneers, 1850-1910; Sunstone Press, Oct 1, 2015.